Winner of the Gold EXCEL Award from Association Media & Publishing! •	Even more convenience: You can cover reading and science content simultaneously and save time with ready-to-use student pages and assessments. •	Even more confidence in your own expertise: You get relevant science concepts and reading comprehension strategies to keep your teaching on track. •	Even more ways to entice even reading-phobic children: Each lesson makes students yearn to learn science from such captivating fiction and nonfiction picture books as Houdini the Amazing Caterpillar; Captain Kidd’s Crew Experiments With Sinking and Floating; and The Boy Who Harnessed the Wind. 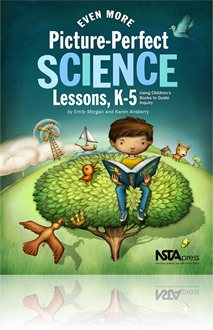 Plus: This latest volume even connects the lessons to A Framework for K–12 Science Education and the English Language Arts and Literacy Common Core State Standards. Just as teachers like you have been hoping, Even More Picture-Perfect Science Lessons delivers the whole package: teacher-friendly lessons, strong standards-based science content, and a kid-magnet formula that will get your students engrossed in science while they improve their reading skills. Even More Picture-Perfect Science Lessons written by Emily Morgan and Karen Ansberry is a wonderful addition to any K-5 elementary classroom. This is a great resource for any teacher who is looking to enhance their science curriculum with fun literacy based picture books. Teachers are given the versatility of having pre-made student worksheets as well as assessments to check for student understanding. Teachers can put their minds at ease knowing that this book follows the Common Core State Standards for English, Language Arts as well as follows A Framework for K-12 Science Education. The content covered in this book is broken down into categories that have a complementary picture book to use in class. Some of these titles include: Do You Know Which Ones Will Grow? -The Three R's: Reuse, Reduce, Recycle -Build It: Invent New Structures and Contraptions –Beaks - What’s Alive? - From Caterpillar to Butterfly - Why Did My Ice Pop Melt? - The Very Hungry Caterpillar - Captain Kidd’s Crew Experiments with Sinking and Floating - Wind Energy: Blown Away! - Come On, Rain! Your students will love the picture books that bring the science content to life!